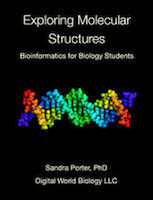 Our bioinformatics course at Austin Community College focuses on basic concepts and techniques. Students learn how to search databases, use molecular models, apply sequence analysis tools, and characterize genetic variation. 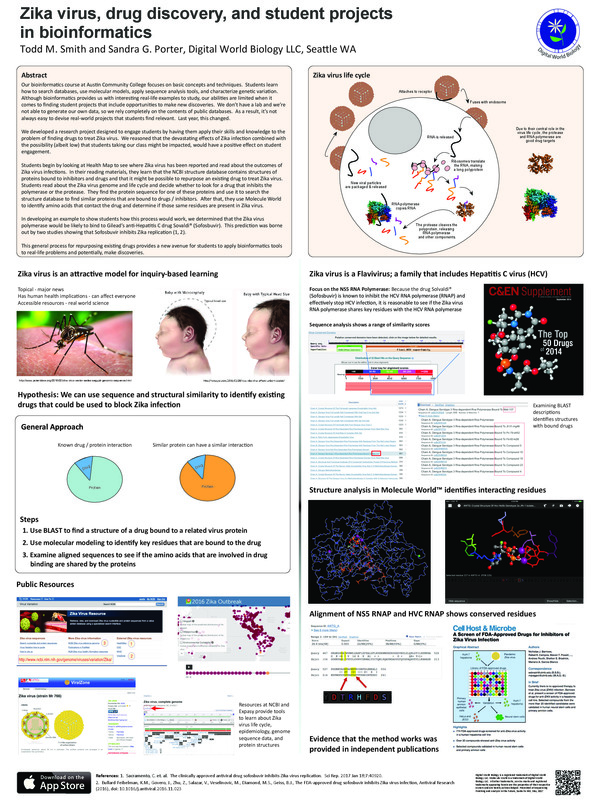 Although bioinformatics provides us with interesting real-life examples to study, our abilities are limited when it comes to finding student projects that include opportunities to make new discoveries. We don’t have a lab and we’re not able to generate our own data, so we rely completely on the contents of public databases. As a result, it’s not always easy to devise real-world projects that students find relevant. Last year, this changed. We developed a research project designed to engage students by having them apply their skills and knowledge to the problem of finding drugs to treat Zika virus. We reasoned that the devastating effects of Zika infection combined with the possibility (albeit low) that students taking our class might be impacted, would have a positive effect on student engagement. Students begin by looking at Health Map to see where Zika virus has been reported and read about the outcomes of Zika virus infections. In their reading materials, they learn that the NCBI structure database contains structures of proteins bound to inhibitors and drugs and that it might be possible to repurpose an existing drug to treat Zika virus. Students read about the Zika virus genome and life cycle and decide whether to look for a drug that inhibits the polymerase or the protease. They find the protein sequence for one of these proteins and use it to search the structure database to find similar proteins that are bound to drugs / inhibitors. After that, they use Molecule World to identify amino acids that contact the drug and determine if those same residues are present in Zika virus. In developing an example to show students how this process would work, we determined that the Zika virus polymerase would be likely to bind to Gilead’s anti-Hepatitis C drug Sovaldi® (Sofosbuvir). This prediction was borne out by two studies showing that Sofosbuvir inhibits Zika replication (1, 2). This general process for repurposing existing drugs provides a new avenue for students to apply bioinformatics tools to real-life problems and potentially, make discoveries. 1. Sacramento, C. et. al. The clinically approved antiviral drug sofosbuvir inhibits Zika virus replication. Sci Rep. 2017 Jan 18;7:40920.